■ Up to 32 x 40GbE ports in compact 1RU form factor. ■ Modular design allowing cost-effective build-out of an infrastructure with switching capacity added as required. ■ 20 x QSFP switch ports, each supporting 40 GbE or 4 x 10 GbE via breakout cables. ■ Two module slots, each supporting 6 x QSFP module or future NPU processing module. ■ Layer 2 or Layer 3 forwarding of 2.56 Tbps full duplex. ■ All ports on front; PSUs and fans on rear. ■ Hot-swappable, load-sharing, redundant AC or -48V DC PSUs. ■ 4+1 redundant, hot-swappable fans. ■ Energy Efficiency: 267 W typical power consumption. ■ AS6701 SKUs compatible with Cumulus®Linux® r2.0.1 and later switchOS software from Cumulus Networks™. ■ AS6700 SKUs compatible with Switch Light OS from Big Switch Networks. The Edge-Core AS6700-32X switch is a Top-of-Rack (TOR) or spine switch for high-performance data centers. In a compact 1RU form factor, the switch provides line-rate L2 and L3 switching across up to 32 x QSFP ports, supporting up to 32 x 40 GbE connections or 104 x 10 GbE connections. The AS6700-32X can be deployed as a TOR switch supporting 10 GbE or 40 GbE server connections, or as a spine switch, supporting 10 GbE or 40 GbE spine interconnects. The switch provides 20 fixed QSFP ports and two module slots, each capable of supporting a 6 x QSFP option module or a future NPU module for application processing. 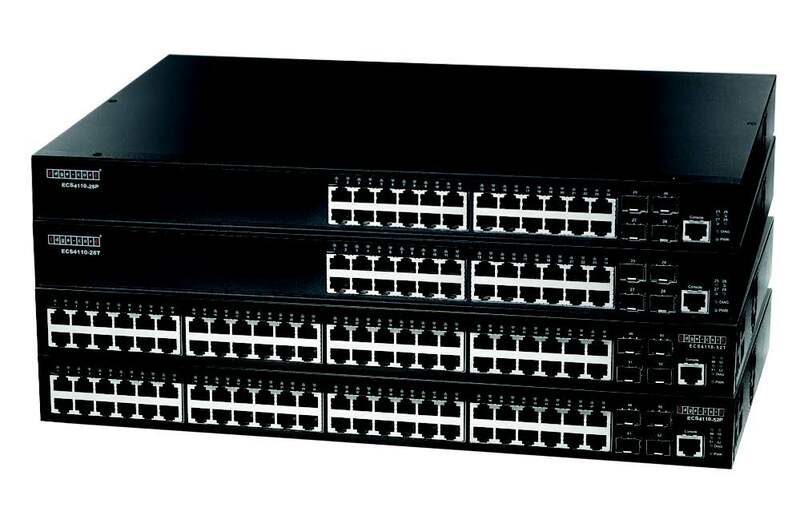 The AS6700-32X is a bare-metal switch loaded with the Open Network Install Environment (ONIE), which supports the installation of compatible independent switchOS offerings.